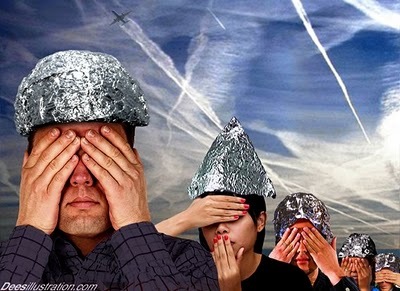 Even as the mainstream media and a television-obsessed American public refuse to admit the existence of chemtrails and government-sponsored weather modification programs, the evidence continues to mount with ever-increasing speed that not only do these programs exist, but they are also effective and widespread. In addition to the recent study published in Environmental Research Letters entitled, “Cost Analysis of Stratospheric Albedo Modification Delivery Systems,” where the costs of delivering tonnes of aerosols into the stratosphere were examined in terms of a variety of different means, a 2010 study undertaken on behalf of the Belfort Group, a Belgian “environmental watchdog” organization, also corroborates much of the information compiled by citizens and activists the world over regarding the existence of chemtrails and stratospheric weather modification programs. Making a distinction between four different types of man-made “clouds” – contrails, chemtrails, distrails (the tunnel produced when a plane passes through a stable cloud), and wingtip vortices (the vortex caused by planes flying at high speed) – the study focuses on contrails and chemtrails. Chemtrail is the contraction of ‘chemical trail’ and is used by some sources to denote intentional spraying by airplanes for military or political purposes and that may be harmful to public health. A more general name is ‘aviation smog,’ which combines contrails, distrails, and ‘chemtrails.’ Authors referring to chemtrails claim that this phenomena is much more persistent than contrails and when sprayed in a grid it is able to cover vast area’s. Although officially denied by government sources many countries performed tests for ‘cloud seeding’ to either generate precipitation where it was needed or to prevent precipitation where it is unwanted. At this moment only the Russian and Chinese governments admit that they use particular matter in order to manipulate weather patterns. Divided evenly between the analysis of the effects of contrails and chemtrails, the Belfort study details some interesting findings regarding the effects on both the weather and human health by traditional contrails in addition to the much more dangerous chemtrails. According to the study, in regards to the average daily temperature and the overall cloud cover generated by contrails on a regular basis, a survey of the average Diurnal Temperature Range (DTR) was conducted during the rare period that commercial air traffic was grounded on and in the days after September 11, 2001. It was subsequently determined that a temperature increase of about 10 C occurred during that period in comparison with the normal values. The increase is larger than during the 11-14 September period for the previous 30 years, giving ammunition to critics who state that weather conditions at this specific period were very extraordinary and no scientific based conclusions could be taken. However even more surprising is the fact that the 11-14 September increase in DTR was more than twice the national average for regions in the United States where contrail coverage has previously reported to have been most abundant, such as the Midwest, Northeast, and Northwest regions. Furthermore, the report suggests that, after the resumption of normal air traffic, there was a temperature drop of 0.80 C which it then uses to justify claims that contrails and air traffic do affect climate. The climate of the earth results from an energy balance between absorbed sunlight and radiative losses of heat from earth and its atmosphere to space. Clouds are an important modulator in this balance. Clouds reflect sunlight back towards space, which reduces the solar energy available to the earth – also called the Albedo effect. Clouds also reduce radiative heat losses to space (greenhouse effect). Which of these two opposing processes dominates depends on many parameters include cloud particle composition, cloud structure, cloud cover, and cloud location. Changes to only one of these parameters can have significant implications for climate. Cirrus clouds thus have a strong greenhouse effect, which may outweigh their Albedo effect losses. As the importance of both opposing effects depends critically on little understood properties, theoretical calculations of the climatic effects of Cirrus are controversial. The main uncertainty stems from a current inability to calculate the scattering of sunlight in Cirrus clouds, since they contain a multitude of ice crystal shapes and sizes, and are irregular in structure. Even more, Stefan Kinne of the NASA Ames Research Center states clearly that the Cirrus Albedo effect is severely underestimated by calculations. This proves that knowledge in this field of science is quite limited and extensive research is mandatory in order to fully understand the impact of Cirrus clouds on climate. In this respect it is noteworthy that evidence of thin Cirrus clouds in the Stratosphere has already been established. With this in mind, the study attributes a substantial amount of climate, environmental, and health risks to the existence of basic contrails, a natural result of regular air traffic. However, it should also be noted that the Belfort report seems to present an apparent confusion in regards to its own terminology, i.e. contrails vs. chemtrails. This is because the term “contrails” is used in some circumstances as meaning the traditional ice trail produced by normal air traffic, and in other circumstances as meaning the typical chemtrail. For this reason, this writer suggests interpreting the term “contrails” as “persistent contrails,” since it is the lack of dissipation that would necessarily produce any cloud creation that one usually associates with chemtrails as well as the concerns in relation to precipitation, pollution, and large-scale environmental and health risks. The conclusion of the study group [Professor Rosenfeld’s] is as follows: both [air pollution, particularly with aerosols, can both increase or decrease rainfall] can be true, depending on local environmental conditions. The amount of aerosols is the critical factor controlling how the energy is distributed in the atmosphere. According to this survey they followed the energy flow through the atmosphere and the way it is influenced by aerosols and other ‘airborne’ particles. On this planet there is indeed an interaction of energy between the different cells within the troposphere in order to obtain a life sustaining temperature (150 C in the International Standard Atmosphere at sea level). Aerosols act twofold: on one hand they act like a sunscreen reducing the amount of energy reaching the ground. Accordingly less water evaporates and the air mass at ground level stays cooler and drier, with a reduced tendency to rise and form clouds.
. . . if there is a surplus of these condensation nuclei as a result of natural activity (e.g. Vulcan eruption) or men’s intervention (e.g. industrial pollution, contrails) the droplets never reach the critical mass needed to fall to earth as precipitation because there is just not enough water to share between all the aerosol particles. Furthermore with a rising number of droplets their overall surface increases, which on turn increases the amount of sunlight reflected back to space with subsequent cooling and drying of the Earth. Thus, aerosol spraying can affect the climate and environment by both increasing or decreasing precipitation and/or, inversely, causing dehydration as well. Professor Rosenberg further states that “The determination of this issue is one with significant consequences in an era of climate change and especially in areas suffering from manmade pollution and water shortages, including Israel.” The latter part of this statement should be very alarming to citizens of all nations, considering the fact that fresh drinking water is increasingly becoming a highly-valued asset in modern times. The obvious side effects of the formation of contrails is the impact on astronomy. One has seldom a clear sky available for observation in areas with dense air traffic. With changing cloud cover and subsequent temperature drop in the upper layer of the troposphere, hurricane activity may be increased as a result of the released instability. It is noteworthy that storms and major floods have more than tripled since 1981. No apparent relationship between aircraft engine emissions, aerosols, contrails and hurricane activity has been established yet on a scientifically basis. It is accepted that knowledge on man made Cirrus cloud is relatively poor and that study of the impact of contrails on the Stratosphere is only in its initial phases. However one can assume that it might have an impact on higher layers and the ozone layer. Ozone depletion does not only occur as a result of industrial activity, but also due to multiple nuclear tests conducted in the 20th century. 1.) Development of a reliable matrix of aerosol ingredients versus field conditions. 2.) Engineering of an efficient, reliable but low cost system in order to seed the atmosphere. 3.) Sponsorship through government agencies with a far-reaching commitment of captains of industry. The Belfort Group thus rightly concludes that all of these elements were in place at the time of the publication of the report (2010) except for the reliability factor. However, the report goes on to summarize an extensive history of geo-engineering projects since the mid-20th Century. Thus, while the report itself does not suggest that the reliability factor exists, the fact that so many years of tests and attempts at geo-engineering does provide the average reader with plenty of reasons to believe that the reliability factor does, in fact exist. Since most projects known to the general public are far behind the true level of sophistication of government/military programs, one would likely be safe in the assumption that the chemtrail/geo-engineering programs are much more advanced than even the Belfort Group is aware of. 1.) Manipulation of climate through modification of Cirrus clouds is neither a hoax nor a conspiracy theory, but currently the best option in geo-engineering considered by decision makers to counter global warming. The impact of production of artificial Cirrus clouds on temperature and precipitation patterns is supported by adequate hard scientific evidence. 2.) The ambition of the United States is to control the weather by the year 2025, both for civil and military purposes (offensive and defensive strategies). This research paper contains a proven track record to support that statement. 3.) The technology to organize spraying actions on a global scale is widely available. Both civil and military aviation is used for that purpose. The mix, containing oxides of metals and chemical components, can either be dispersed through special designed pods or directly incorporated into the jet fuel. This research paper is well documented in this respect. 4.) Since the patents are owned by the main defense contractor for the U.S. armed forces (Raytheon) or the U.S. Department of Defense itself and given the history record it is obvious that current climate manipulation programs are organized and directed by the United States government. 5.) The spraying actions in Europe are only possible with prior approval and intense co-ordination on top government level and industry on executive level. The general public is intentionally kept unaware of the existence of such projects. 6.) Although the spraying actions may be considered legal these actions may have a potential detrimental effect on health. There is sufficient scientific evidence available in this research paper to support this thesis. The report also presents four sets of recommendations in going forward regarding chemtrails or, as the report chooses to classify them, manmade contrails. a.) Artificial Cirrus clouds should be classified as a separate cloud genus by the WMO. Additional scientific research with the effects on nature and public health on this subject should be considered. Results – whatever the outcome – should be made public. b.) It is unacceptable that the AWACS aircraft fleet under NATO operates under a Luxembourg registrations without complying with civil aviation regulations. This is a flagrant violation of the law and this should be corrected in the near future. Given the very unfavorable engine emission ratios of this aircraft retrofitting of these engines should be considered as soon as practical. c.) When considering a legal case it is better to sue an industrial group, such as Raytheon, rather than a government agency. It is clear for us that the responsibility of Raytheon in this respect is far reaching with the creation of a monopoly in climate modeling or weather as a geo-engineering or a military instrument. If possible an international ban should be placed on such weapons. d.) Although the existence of weather modification projects have been illustrated in an adequate way in this research paper it is now the duty of a serious politician on any level to make enquiries to the government for public release of these spraying schemes through aviation. It is mandatory that such a statement should include the reason why such operations are conducted. It is not an option to hide behind the motive of national security. Unfortunately, with the exception of an expanded awareness of chemtrails (or persistent man-made contrails) amongst the general public, the recommendations made by the Belfort Group have gone completely ignored by those in government, science, academia, and the mainstream media ever since its publication. Regardless, the Belfort Group’s report stands as yet one more documented piece of the puzzle regarding the incessant spraying campaigns now taking place worldwide on a daily basis. While immediate action is not to be expected at this time, the Belfort Group’s report and all other available resources, must be used by those of us who are aware of chemtrail spraying campaigns to educate those of us who are not. Kinne, S., Cirrus clouds and climate, NASA Ames Research Center webpage. *Citation provided by Belfort Study. Keckhut, P., Hauchecorne, A., Bekki S., Collette, A., David C., and Jumelet C., Evidences of thin Cirrus clouds in the stratosphere at mid-latitudes, Service d’ Ae’ronomie/Institut Pierre-Simon Laplace, CNRS, Verrie’res le Buisson, France, Received: 28 December 2004 – Accepted: 17 January 2005 – Published: 21 June 2005. *Citation provided by Belfort Study. Rosenfeld, D Does Air Pollution Increase Rainfall?, Hebrew University of Jeruzalem, September 5, 2009. *Citation provided by Belfort Study.